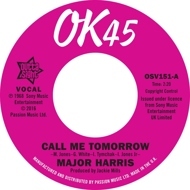 MAJOR HARRIS, one time member of the Delfonics, kicks off 2016 with a 'major' slab of Northern Soul in the shape of his dancefloor anthem 'Call Me Tomorrow'. Recorded in 1968 for Okeh Records this non-hit rarity has soared in value in recent times changing hands for up to £500 and making it a worthy debut for the new season. After leaving Okeh in 1974 Harris signed to Atlantic Records and scored a string of R&B hits including his top ten gold disc 'Love Won't Let Me Wait'. WALTER JACKSON is no stranger to the rare soul scene but perhaps his least likely dance floor hit is his 1965 soulful rendition of Pete Seeger's political folk song 'Where Have All The Flowers Gone'. First introduced at Manchester's famed Twisted Wheel club and packed the floor at Wigan Casino circa 1977.